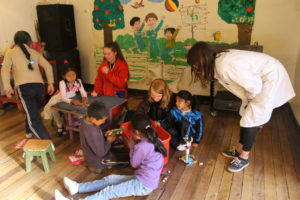 Past the tourist attractions and among the winding streets of Cusco, there stands a gate which holds a paradise for the underprivileged children of Cusco—Aldea Yanapay. It was founded nearly fifteen years ago by Yuri Valencia, who, as a boy growing up in Cusco, was lucky enough to have loving parents and a big, beautiful house. Going to school every day he noticed the poverty around him and the difficult lives of all the other students, so when he was an adult, he founded a school for these kids named Aldea Yanapay. His parents gave him their villa to turn into a hostel for the volunteers at this school and named it Villa Magica. This is where I spent three weeks of my summer between my sophomore and junior year of high school. Aldea Yanapay is an after school program that runs from three in the afternoon to seven in the evening. The children arrive at three, and have classes until four thirty. Their options are singing, dancing, art, computers, homework, or games. From four thirty to five they have free time in the courtyard, and from five to six there is the Circle of Love. Led by the two coordinators, during the Circle of Love all the children and volunteers sit in a circle, sing songs, say things they are grateful for, and things they are hoping for. Many of the children will give thanks to specific volunteers, and many also say phrases such as “I hope my sister is healthy,” or, “I hope they find my missing little cousin.” After the Circle of Love, the kids split up into families of around six students and three volunteers to practice a two-minute show for every Friday. The themes of the show range from topics such as health to world peace. In my second week at Aldea Yanapay, the theme was love and peace, and my family sang One Love by Bob Marley. After family time, the kids get a glass of milk, and once they finish their milk and wash their cup, they are dismissed. The children who attend Aldea Yanapay are between three and sixteen, and come from the more disadvantaged families of Cusco. “We work with not only economic poverty but also emotional poverty,” says 24-year-old coordinator Andrea Suarez-Rey. “We have kids who are missing the basics, such as food or drink, but we also have kids who have all these things and go to school but are victims of alcoholism, on the part of their parents.” Considering this, it is no wonder many of the children at Aldea Yanapay are very much impacted by their situation at home. “Many of the children at the school may have fathers who are alcoholics and hit their wives. As a result of this, the wives often take their frustration out on their children,” Andrea added. One day, a three-year-old boy could be aggressive and mean, while the next day, he could be asking for hugs and giving the volunteers kisses. “Aldea Yanapay gives a lot of opportunities, and taught me to give a lot of love, because not all homes give a lot of love, but here you have a lot of love,” says eleven year old student Milagros. 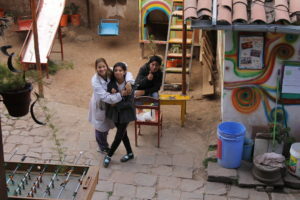 At the beginning of my volunteer work at Aldea Yanapay, I was convinced I was going to a school to teach and help kids. By the end of my third week, while I hugged the children goodbye, all of us crying, I realized the kids had taught and helped me also. They showed me what it meant to be strong. Some of these children would go to sleep hungry every day, and some were facing abuse at home, but everyday they would still show up to school smiling. Several of the volunteers could speak very little Spanish, but the children would still go to them for hugs. Aldea Yanapay taught me, teaches children, and continues to teach more volunteers, that love breaks all language barriers, and that even when life gets difficult, there is love. In the words of six-year-old student Viola, “Aldea Yanapay taught me how to be a flower”. Nice work, congratualtions! we need more ‘Aldeas Yanapay’ over the world, then we can still sow hope and peace for our children and the next generation.